An F2 tornado ripped through the Atlanta Motor Speedway in early July 2005 with winds over 150 miles per hour, causing extensive damage to the track's suites, grandstands and surrounding buildings. With the Bass Pro Shops MBNA 500 set to run the weekend of October 28, track officials had to act fast, bringing in cleanup crews and contractors for extensive rebuilding in time for the crucial race. With more than 150,000 race fans expected to attend the race, Speedway Motorsports Inc. immediately began planning the facility's unexpected rebuilding. Lennox Industries was contacted for the emergency replacement of most of the rooftop air conditioning units destroyed by the twister. "We contacted Lennox four days after the storm and they showed up in Atlanta at a moment's notice to estimate the scope of the damage," said John R. Zudell, Senior Construction Manager for Speedway Motorsports Inc. "Other HVAC manufacturers we talked to were not confident they could get the job done with such a short turnaround. But Lennox stepped up to the plate and said they could tackle the job in the allotted time." Lennox did just that. On July 18, Lennox' Southeast Commercial Division was given an order for 17 10-ton T-Class™ electric/electric rooftop units, 14 five-ton 16 Series rooftop units, 17 10-ton HS29 condensing units and 17 five-ton condensing units. Lennox' factory employees worked late hours and weekends building and customizing rooftop units for the racetrack suites. In less than four weeks, the equipment was delivered to the racetrack; less than ten days later, installation was complete. 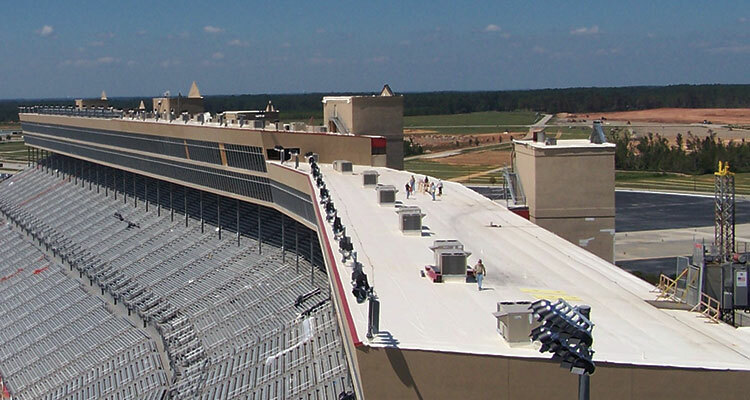 "As the HVAC and plumbing contractor for the Atlanta Motor Speedway rebuild project, my primary goal was to ensure all new equipment was ordered and installed in very little time," said Edd Hill, President of HVAC Inc. "I had worked with Lennox before and was confident they could expedite the manufacturing and delivery of the HVAC equipment on a short schedule. Lennox accommodated our specific needs and worked closely with us to deliver the equipment fast and get the HVAC systems up and running," said Hill. "We had the ability to increase production capabilities to get this job done, and we knew that our quick responsiveness was important to Atlanta Motor Speedway's business," said Brian O'Connor, Manager of Business Development for Lennox Industries. "Essentially Lennox delivered the equipment for a 16-week order in a quarter of the time it normally takes, and the facility was up and running for the Bass Pro Shops MBNA 500," said Zudell. "Lennox's contribution to this major team effort was impressive. They replaced 80 percent of the HVAC units servicing 105 suites on the property. From now on, Lennox is going to be our HVAC supplier of choice for the Atlanta Motor Speedway." Lennox Industries partnered with NASCAR star Rusty Wallace and the Penske Racing South team based in Mooresville, North Carolina starting in 1998. Lennox remains an active associate sponsor of Wallace and the Penske Racing South NASCAR NEXTEL Cup racing operation. "In addition to supporting the NASCAR industry, the partnership has offered increased business to business opportunities such as an exclusive partnership with Exxon Mobil as well as a strong business relationship with Roger Penske, founder and chairman of Penske Corporation," Brian O'Connor said. Because of Lennox' commitment to the sport and its existing relationship with Speedway Motorsports, Inc. (SMI), Lennox also hosts hospitality events at various NASCAR races in Atlanta, Bristol, Charlotte, Las Vegas and Texas. "We look forward to a continued long-term partnership with SMI because we work together in a variety of different ways that benefit both businesses. We hope to remain SMI's HVAC supplier of choice for many years to come," said O'Connor.